The old double bill of Mascagni's Cavalleria Rusitcana and Leoncavallo's Pagliacci may not be so popular with professional companies nowadays, but elsewhere they remain inseparable and you can see why. Their stories of jealous revenge are swept along by passionate music, not to mention the hit numbers. With Tosca, Butterfly and Traviata behind them, Cav and Pag were a natural for operahouse, who started up nearly five years ago as an independent spirit in local music drama. I suspect they needed another outlet for their enthusiasm, because the same principles pop up with Charnwood Opera. They claim they will perform anywhere, but they would be overwhelming in your front room, judging by this café style production in the Carillon Rooms. There was room for a decent audience at their tables without the action being too much in your face, but the lowish ceiling kept the sound level high. The programme notes needed careful reading, too, but once under way, the dramas sung in English were easy to follow. The prologue to Pagliacci set the mood, with Paul Blakemore's Cappo the sympathetic guiding figure. 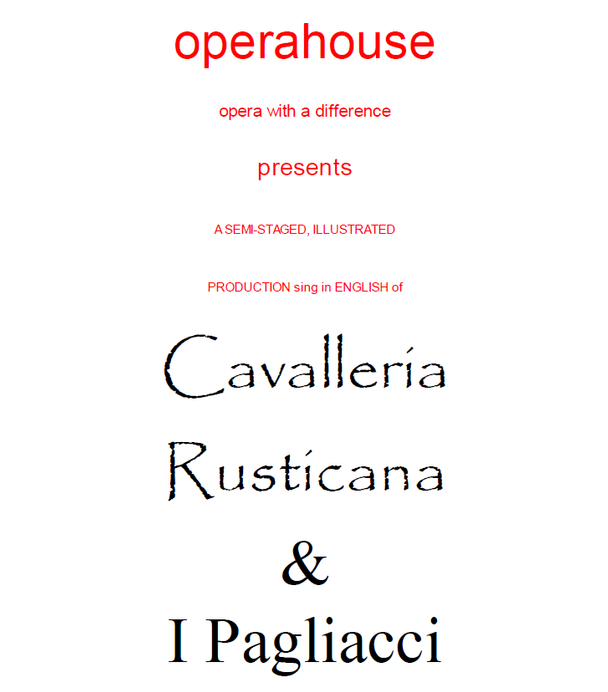 Cavalleria Rusticana then followed. As Santuzza, Clare Proctor seemed less at home here than as Nedda in Pagliacci, a part she had perforce to learn in under six weeks. It shows what necessity can do. In good voice, she was a believable Italian peasant in each opera. David Toft had a wild look and initially an appropriately raw vocal quality as Turiddu. Alan Speight's musicality made Alfio seem too prim for someone who turns passionate assassin. Naomi Wollacott was a rather girlish Lola, and I wanted to hear more of Kate King. The company singing the Easter Hymn (touches of keyboard organ) was properly affecting, like a village congregation, and the famous Intermezzo did not suffer unduly in its piano reduction. Anthony Wilson played both scores with stylistic empathy. In Pagliacci the drama was tauter. From Andrew Lamb's vocally rather good Silvio trying to win over Nedda in a fine duet, it moved swiftly to Lyndon Gardner's famous challenge and despairing 'On with the costume' (better than 'motley'?) as he prepared for the clown's performance. David Toft's Beppe and David Henshaw's Tonio were sound in support, but Gardner, at his finest vocally and dramatically, carried the day.